The Half House (1947) may be Young’s most notable creation and a major reason for cars, bikes and walkers slowing down along Park Avenue. It looks like one half of the house is missing. 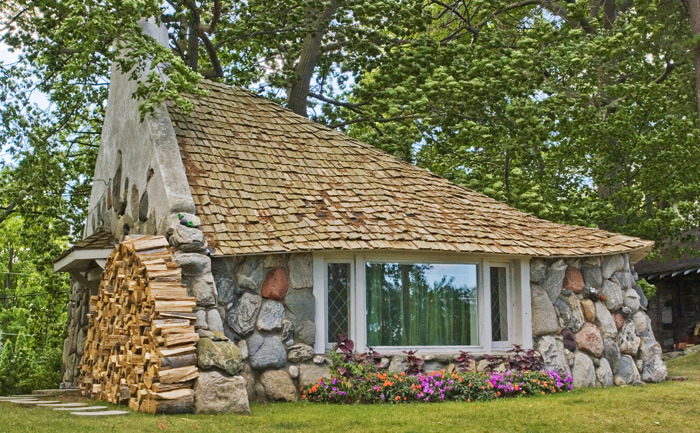 The sloping wavy roof and large colorful boulders give Young’s smallest cottage an organic appearance. It appears to have sprouted from the ground among the trees it sits beneath. Young built this little button-shaped home as a honeymoon gift for his daughter Louise. Photo © copyright by Mike Barton.